Comet ISON originated from Oort cloud lost it's tail during it's close encounter with Sun during November 2013. 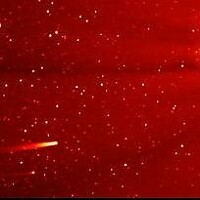 It is like death of a comet after loosing it's bright tail that fits for a comet a solar body category. ISON comet was moving around 350 km/sec speed in Sun inner atmosphere heating up at 5000 degrees celcius temperature. According to latest observations in solar sky, ISON does not exist at all in it's trajectory. It is completely baked and vaporized upto it's core in Sun expreme atmosphere during it's close encounter with the star. According to sky enthusiasts in coming week when the comet might be on it's way towards the Earth sky it can be found as remnant of a baked celestial body. ISON to be a great subject of astronomical study as it pass through the closest possible surviving path within the Sun atmosphere.